There’s been a lot going on this past week and all sorts of news in the legal arena that I’ve been wanting to comment on but just haven’t had the time. The internship at I-Cubed has been a lot more enjoyable than I thought corporate work would be,1 grades for Summer Session I courses have all come in,2 it looks like I’ll be the CrimLaw tutor next Spring for the 1Ls and this Fall for the 2LEs,3 I was invited to give a leadership development presentation to the NCCU SGA earlier this week4 — there’s just been a lot going on in a very short amount of time! Before diving in to the data, I want to give a huge *THANK YOU* to everyone who participated! We had nearly two-dozen people submit their anonymous information, including folks from the upper and lower ends of the spectrum. Coupling those with some data points provided by the Registrar we’ve got what should be fairly accurate models for each of the 3 classes submitting information. 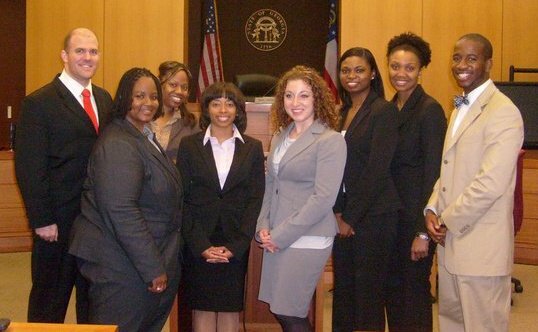 The NCCU Law cohort that started in August 2009 began with 169 students, which had whittled away to 157 by the time our 1L year was finished. Factor out the 18ish folks who fell below a 2.0 and another handful who enrolled in the 4-year JD-MBA program (pushing them into the Class of 2013), then add in folks who transferred in from the Evening Program or are from the August 2008 cohort who are now “in sync” with our class (either from being in a dual-degree program or being readmitted after falling below 2.0 in the 2008-09 year), and we’re down to 152 people. You can see the impact of students being able to self-select their courses as each of the percentile cutoffs have climbed since last year. The biggest jumps have come at the lower end of the ranking spectrum; for example, the 50th percentile cutoff is actually higher than my GPA last year when I was at the 40th percentile. You can also tell from my class rank that there’s a decent amount of fluidity in the rankings. I jumped from #62 to #32 in the span of a year,5 with only a just-over-three-tenths-of-a-point bump in my GPA (e.g. a hair’s breadth greater than the difference between a B- and a B). Not to continue beating the same dead horse, but that data point tends to reaffirm my argument that your 1L grades don’t matter. Based on the incoming class profile, this year’s 1Ls were an interesting mix. On the similarities side of the ledger, their class started out slightly larger than mine (174 for them compared to 169 for us) but had shrunk the same amount (-12 students apiece by the end of 1L year). The 75%ile/median/25%ile LSAT scores were also practically identical between the two cohorts. 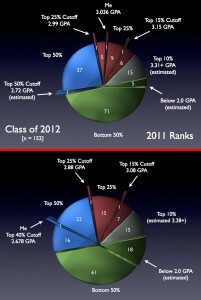 But on the differences, the Class of 2013 was more polarized. The median age was almost the same (25 to our 24) but the Class of 2013 had more “really young” students in the 21-24 range and more “not as really young” students in the 40+ range. On the GPA side, they also had more students who did better than us in undergrad (75%ile GPA was +0.11) and more students who did worse (25%ile GPA was -0.12). 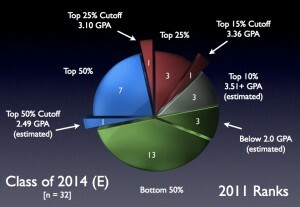 That polarity also shows up from two points in the 1L ranking data: (1) both their 15%ile and 25%ile GPAs are higher, meaning their high achievers racked up comparably more of the high grades than ours did; and (2) it looks they’ll have a lower number falling below a 2.0, meaning their low achievers soaked up comparably more of the low grades than ours did. 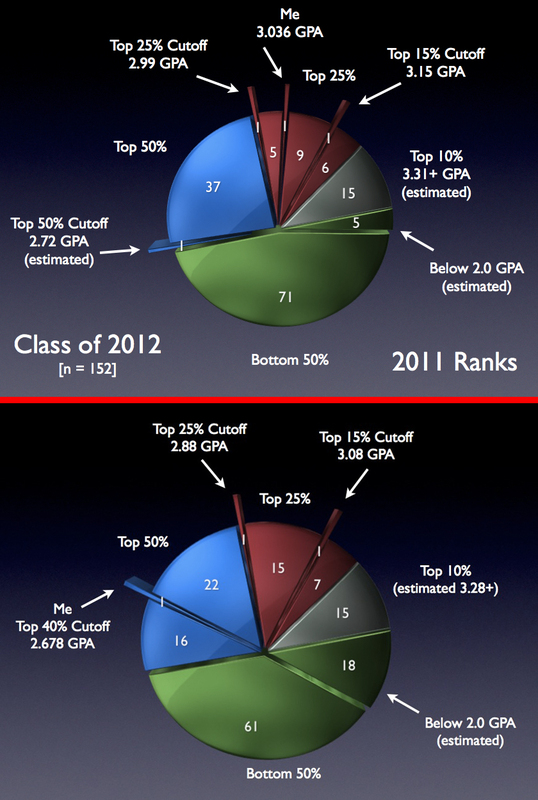 Really high and really low grades were more broadly distributed in the Class of 2012. You can also see the effect of the C-curve to an extent. Even with the low-ranked students taking up more of the bad grades, the median is still almost two-tenths of a point below a B-. And even with their higher-achieving high achievers, no one in the Class of 2013 scored above a 3.78. When I started this data gathering operation I really didn’t expect anyone from the law school’s Evening Program to send me their information. They were extended the invitation of course, but I only know maybe 3-4 people in the entire program who I know have been to law:/dev/null at least once so I figured the odds of someone seeing the call for submissions were a bit low. 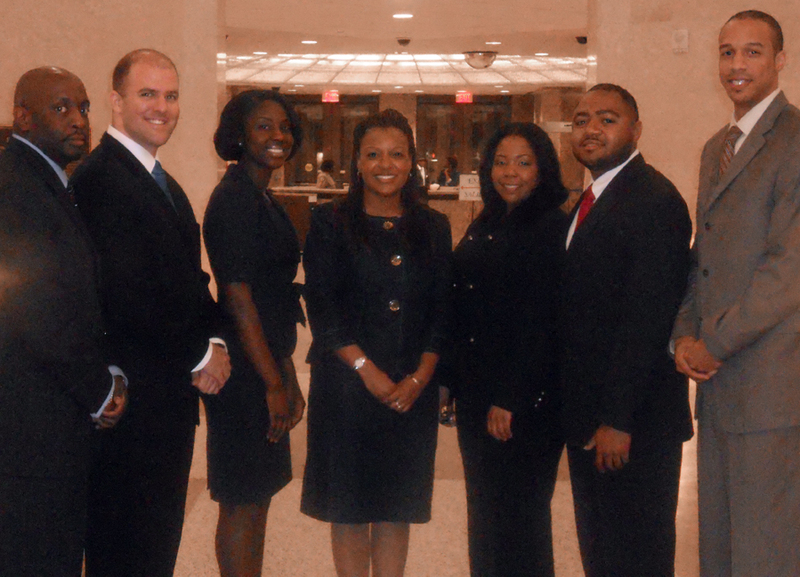 The Class of 2014 Evening Program started out with 34 students in Fall 2010, which has since shrunk to 32. They’re also ranked separate and apart from their Day Program colleagues so the data isn’t quite as useful for analysis except on a year-over-year basis. For example, on a percentage basis the 1LE 15%ile and 25%ile cutoffs are markedly higher than the corresponding 1L cutoffs. But there are also only 8 1LE’s at a 3.1 GPA and above, when there are twice as many 1L’s at 3.2+. In other words, to borrow an over-used cliché, comparing the Evening Program to the Day Program is akin to comparing apples and oranges. One commonality that can be culled from the data is that the Evening Program is obviously bound by the same curving process since their median GPA (even with fewer students) is similar to the median for the day program. Hope all of you have a good night and a great weekend ahead! I’m already falling behind (again) on keeping law:/dev/null up-to-date, but seriously hope to get back in the swing of things once the semester is finished. Turns out it’ll be stretching a little bit longer than planned for me. My first final is Business Associations on Friday April 29th @ 2:00pm, with Criminal Procedure following @ 2:00pm the very next day. (Un? )fortunately one of my Legal Eagle colleagues has protested and gotten the CrimPro exam pushed back a few days for us 2Ls — apparently NCCU Law‘s exam conflict policy, intended to apply only to exams with start times within 24 hours of each other, is written in a sufficiently broad manner that it could be read to include exams where any portion of the whole start-to-finish exam window overlaps with another in the same 24 hour time period. Hope all of you have a great night! 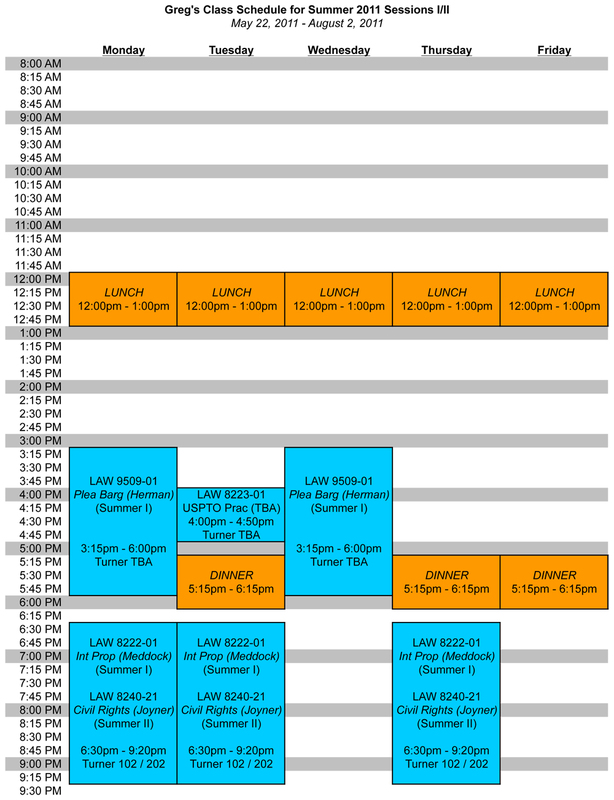 One of the downsides to still having no clue what I want to do after I pass the bar is that I’ve got a long list of classes I’m still interested in taking and not enough time to actually take them. Plea Bargaining: Taught by the same professor who taught my ADR Practices course (and from whom I earned my first bona fide A in law school), I’m taking this class to complement the other coursework I’ve already knocked out if I end up going the criminal prosecution route.1 My uneducated guess is that this will be functionally similar to the other ADR courses I took last year, but with a negotiating eye focused more toward evidence and admissibility issues to provide the leverage in negotiations. U.S. Patent & Trademark Office Practice & Procedure: Since my undergrad degree was in computer science, I’m able to sit for the patent bar without any further technical education if I decide to take it. This course is the classroom prerequisite for anyone taking our USPTO Clinic in the Fall/Spring, so I wanted to get some exposure to how the USPTO works just in case I decide to dabble in IP. It’s only 1 credit and taken pass/fail but will (hopefully) provide some useful insights. Time-wise, the schedule is somewhat similar to what I took last summer with late afternoon and night classes on Monday / Tuesday / Thursday. The upshot is that there’s no Friday or weekend classes like I had with ADR last year, so that gives me time to catch up on anything I need to catch up on. It also leaves me free during the day once I figure out what I’m going to do internship-wise, be it heading back to I-Cubed or working pro bono for a local DA’s office (or something else entirely). The main reason I signed up for NCCU Law‘s Scientific Evidence course this semester was because it’s being taught by Professor DVLaw, a challenging professor but one who focuses on making sure students know the material and how to apply it. She invited the class to sit in on a national conference for judges titled “Developmental Forensics of Children Adjudicated by Courts” where she is one of the attorneys moderating today’s panel on genetic testing of minors. I decided to head over there after I was done tutoring the 1Ls in CrimLaw.1 And let’s just say I wasn’t impressed. On the positive side, the place was packed wall-to-wall with a wide variety of people from all over the place. I got to meet judges from North Carolina, New York, Texas, California, Maryland, and several places in between. One session debated a hypothetical involving a 16-year-old who was pregnant with a fetus potentially carrying a fatal gene, with the issue being how the judge would rule on a request to have the fetus tested against the mother’s will based on a variety of variables. You had the “gunner” types who felt the need to raise their hands and talk at every single opportunity. There were the judges who gave long-winded answers that didn’t actually address the question. The ones who were too timid to actually say anything publicly, but would lean over and comment to the people on either side of them. The political ones who always gave the same answer no matter the change in underlying facts and case law. The list goes on. The panel discussion focused on a child with a predilection for pyromania, committing arson occasionally, frying a cat in a microwave, and so on, and asking how the judge would rule on a prosecutor’s motion to have the child tested for a “violence” gene or some similar genetic marker.2 Here there wasn’t even that much discussion of the law — one of the judges turned to one of the science experts on hand to ask if such a gene existed, asking “I just need you to give me the science and then I can make a ruling.” The scientist goes “for the sake of argument, assume there is”… at which point every single judge in the room said they’d order the testing. Maybe it’s because I come from a science-oriented background at N.C. State, but that kind of reflexive judicial fealty to experts makes me apprehensive. Science isn’t law; while we might have “settled law” on some issues, we rarely ever have “settled science”.3 You don’t just have to take my word for it either: you can read the 352-page indictment of forensic sciences issued by the National Academy of Sciences a couple years ago. My hope was that the folks in the black robes would be more circumspect in their decision-making. More tomorrow. Until then, have a great night! I swear I’ve got one of the most profoundly blessed lives a guy can have — it makes me worried I’m going to use up all my good fortune before I hit 30! No sooner did I get back to the Bull City from the TYLA regionals than I got a phone call from Madame Prosecutor. 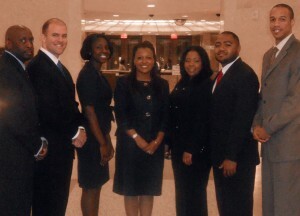 Turns out one of the members of NCCU Law‘s 2L AAJ trial team had to step down due to family issues, leaving the team 1 person short of the 4 they need to compete in Atlanta on March 3rd-6th. So they asked me to fill in! Definitely a win-win situation, even though I’ll probably have to scale back on the academics a little bit more We’ll see how it goes… but for now, I’m excited!